It’s quite rare that you come across a woman that is, audacious, bursting with energy, warm, politically attuned, has had much experience, can take direction exceptionally well and ISN’T middle aged. After having been with RMK since she was 7 and winning speech and drama competitions since she was 4, you could say that speaking is now in her blood! As a result, her wisdom and experience far exceed her years. Her voice has been heard across the globe, from being the Aussie voice of a leapfrog teddy bear in Asia, to narrating the internationally acclaimed Palaui Pledge. Even close to home, Luna Park, ASIC, Weetbix, and Commonwealth Bank have been just some of her credits. 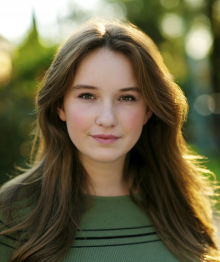 Claudia’s experience in acting courses at NIDA, The Actors Lounge and Drama World have taught her great control over character, intuitively interpreting scripts and understanding the director’s vision. Overflowing with energy, she can hype up your audience, tug on on your heart strings by breathing life into characters, or sooth you with her seductive, husky voice. Claudia is a regular at Uncanny and always brings great vibes to the studio. She has the voice to deliver a youthful, husky tone that the clients love, and her ability to interpret client direction always makes sessions a joy. Looking forward to many more sessions!